This will be the last article in the Selling Your Crochet Series. If you have been following the series you will know how to decide on what to make, how to determine your price point and target market, how to get the prices you deserve and not let guilt and fear keep you from finding success, how to decide where to sell and the importance of finding your own niche. This article will be dedicated to how to make sales, marketing and advertising. I will go over some of the ways you can get more fans to your fb page, and how you can increase your sales with social media and word of mouth. If you haven’t been following the series, I recommend starting from the beginning. All of the articles in the series are listed below. Advertising and marketing are a very important part of owning your own business. In order for someone to buy from you they have to know you exist and what you sell. It helps for them to see examples of your work. There are many free and paid options available for marketing your work. We will discuss some of them in this article, thought the possibilities go on and on. Invest in business cards. There are many different cost options available. You can purchase blank business cards that come with templates from any office supply or stationary store. You can also find inexpensive options on-line at pages like Vista Print. You can choose from one of their ready-made designs or upload your business logo or a photograph of your work and create your own design. Just make sure your card has 1) a way for clients to view your work, either a Facebook page, Etsy store or website/blog, 2) a way to contact you such as email or a phone number, and 3) your business name and/or your given name. Make sure you add a signature line to your email sharing the name of your business, what it is that you sell and a link to where it can be found. It is not necessary to be active in social media in order to have a successful business but it sure does help. Especially since social media is how most businesses effectively communicate their products to consumers. Facebook you can have a separate note or file that has a price list so that people can easily find the information without having to ask you. You can also have a ready to ship (RTS) album with the prices listed there. Be sure to keep open lines of communications with your followers. If they feel like you are just trying to sell them something they will probably not stick around. I have made more sales just posting pictures than I have when I put “for sale” in the description. If someone wants it they will make sure they ask about it. There are many options available for giveaways that can help increase your customer base and social media followers. You can either host your own or participate in someone else’s. One popular way is hosting a giveaway at certain intervals of Facebook fans. I hosted a giveaway when I got to 500, 1000, 1500, etc. on my blog. I’m now at over 4,300 fans and I will be running my next contest at 5000. Facebook is very particular about how you do contests, please be sure to research it first. Rafflecopter is a free contest app that works well with Facebook. For a giveaway you can give a free pattern, a free item, a gift certificate to a yarn store, free yarn, a hook or a yarn bowl, etc. I use my giveaways to also help promote other Facebook pages. I have teamed with some special people who allow me to use their items as giveaways in exchange for advertising space on my blog (you can read about my affiliate program here), but I have also purchased items to give away to my fans in the past. You can partner giveaways with any type of requirement on the part of those who enter: Liking your page on Facebook, pinning something to Pinterest, Tweeting about something. Take a look at other giveaways to see what ideas appeal to you. There are many free options for owning your owl blog or website. They can be great advertising tools. There are many blogs or websites who will do logo/button exchanges as a swap. They will put your logo on their blog if you put their logo on yours. Look into partnering with other companies that are similar to yours but not exactly the same. If you sell baby items only, look into partnering with someone who sells only adult items. Or even look into partnering with someone who sells yarn, or hooks, etc. Same as above, except it is paid for by you. Many blogs offer paid advertising on their site. You can advertise on pattern directories such as The Yarn Box and AllFreeCrochet or you can advertise on other business websites that sell crochet/craft products. The best advertising you can get is word of mouth advertising. Some ways that you can get great referral/word of mouth advertising: Be sure to respond quickly to sales or inquiries. Provide excellent customer service. Peddle only high quality goods. You can also add a hand written thank you note to all of your shipped sales to increase the likelihood that someone will think to refer you to someone else. Not only is it the best type of marketing but it is completely free! Whether you employ some or all of these techniques for marketing and advertising any little bit will help. There are other ways to advertise that are not mentioned her and in order to be successful you will continue to keep your ears and eyes open to opportunities. Be sure you are doing the things that feel the most comfortable to you. If you are not comfortable giving an item away for free, then don’t. There is no harm in choosing some advertising over others. Your last and final homework assignment is to sit down and brainstorm the best advertising options for you! Put at least one into effect. If you have any idea’s on other ways to advertise you can comment below to share them with the other Cre8tion Crochet followers. I hope everyone has enjoyed me Selling Your Crochet Series. I hope that I have helped a great many of you to find confidence and success in your handcrafted business. I appreciate all the positive feedback I have received from this series and I am extremely happy that I have been able to help those who have contacted me! The next series will be on owning your own crochet blog and will be geared more towards pattern designers. I am going to take a week or two off to work on another big project I have going on. Lorene Eppolite is the editor of Cre8tionCrochet.com and Cre8tiveLiving.com. 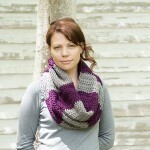 In 2012 she started publishing free crochet patterns on her blog. She has been featured in The Yarn Box, Lion Brand Facebook page, Red Heart Facebook page, The Crochet Crowd and All Free Crochet. She is now the official crochet designer for Darn Good Yarns. Lorene is the host of her own TV show Cre8tion Crochet LIVE- which airs weekly on Wednesdays 9pm EST. Lorene and Cre8tion Crochet’s mission is to help other crafters find success with their crochet business and to find confidence in their work!